Evan is a Counsel in the Osler litigation group. His litigation practice has particular emphasis on class action defence, complex commercial litigation and arbitration matters. Evan focuses on cases involving technology and data, such as disputes involving data licensing, privacy, data security, IT projects, online defamation, and protection of confidential information. He is also a member of the firm’s cross-disciplinary team advising on issues relating to blockchain technology and crypto-currencies, particularly with respect to potential regulatory enforcement and other risks. Evan also litigates cases involving franchise law, securities law, competition law, product liability, and construction law, as well as general commercial matters. He has appeared as counsel in numerous trials and appeals in the Ontario courts and the Federal Court of Canada, as well as in cases before the Information and Privacy Commissioner of Ontario and the Ontario Securities Commission. 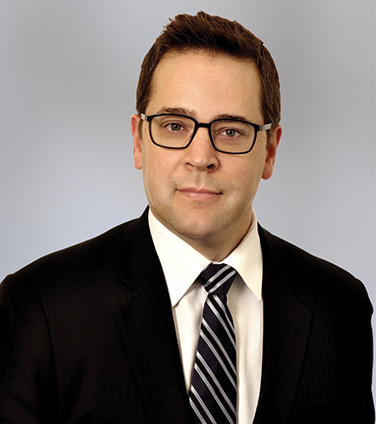 Evan is the Co-National Editor for the Commercial Litigation and Arbitration Review and a member of the Executive for the Ontario Bar Association’s Class Actions and Privacy & Access to Information Law sections. Evan regular volunteers as duty counsel assisting self-represented civil litigants, acts for charities and not-for-profit organizations on a pro bono basis, and has been a trial advocacy advisor for Ryerson University’s Law Practice Program. Shoppers Drug Mart, in the ongoing defence of $500 million class action by pharmacist store operators. Sapient Canada, in the trial of a commercial dispute arising from the termination of a subcontractor in an SAP implementation project. A data provider, in an arbitration of a dispute over the use of data under a data licensing agreement. A major Canadian university, in a trial of claims concerning the use of excerpts of copyrighted material on online learning management systems. Companies developing cryptocurrency and blockchain platforms in responding to regulatory inquiries. Customers of a cryptocurrency trading platform in claims arising from the trading platform’s shutdown and loss of assets. A leading producer of monitor products, in a class action relating to allegations of anti-competitive conduct in the distribution of computer monitor components. Numerous clients, in protecting commercially sensitive information against disclosure under access to information legislation. A manufacturer, in defending claims for over $100 million in damages by a wholesaler alleging misuse of the wholesaler’s confidential data. A technology company, in the defence of oppression remedy claims by employee-shareholders. Various franchisors, in defending claims by franchisees alleging misrepresentations and/or failure to disclose material information. The Best Lawyers in Canada, 2019: Franchise Law. OBA Markus Cohen, Q.C. Memorial Award, 2016: Excellence in Franchise Law. Crypto Litigation and Civil Disputes, Osgoode Certificate in Blockchains, Smart Contracts and the Law (November 2018) (lecturer). Blockchain 2018 Part 1: Initial Coin Offerings, Blockchain 2018 – Capital Markets and Beyond, Ontario Bar Association (November 2018) (co-presenter). Emerging International Issues in Regulation of Blockchain and Cryptocurrencies, DRI Annual Meeting, San Francisco, CA (October 2018) (co-presenter). Getting Ready for Canada’s Mandatory Privacy Breach Reporting Requirements, Ontario Bar Association (September 2018) (co-chair). Cryptocurrencies, Eighth Annual Securities Symposium, The Advocates’ Society (September 2018) (panelist). Blockchain, Cryptocurrencies and Civil Disputes, National Judicial Institute (May 2018) (speaker). Dealing with Innovation: Blockchain, Cryptocurrency and Evolving Regulatory Challenge, guest lecture for course in US Securities Regulation in Comparative Perspective at Osgoode Hall Law School (February 2018) (co-presenter). At the Cutting Edge: Leveraging Innovation to Advance Your Career, panelist at Osgoode Hall Law School (February 2018). Securities Regulatory Issues with Crypto-Currencies, guest lecture for course in Cryptocurrencies, Cryptoventures and the Future of Exchange course for GPLLM Innovation, Law Technology program at University of Toronto Faculty of Law (February 2018). Defence Issues, panel at the OBA 9th Annual Class Actions Colloquium (December 2017) (moderator). Annual Legal and Legislative Update, presentation at the OBA 17th Annual Franchise Law Conference (November 2017) (co-presenter). The Oppression Remedy: A Work in Progress, paper and presentation for Shareholder Disputes and the Closely-Held Company: Rights and Remedies for Litigators and Corporate Advisors, Osgoode Hall Professional Development (April 2017) (co-presenter with David Morritt). Negotiation Concepts and Strategies, presentation at Ryerson University Legal Innovation Zone Lunch & Law (February 2017). Risk Management in a Big Data Environment, presentation at the Institute of Law Clerks of Ontario (September 2016) (co-presenter with Vanessa Cotric). Protecting Your Franchise System on the Internet, roundtable presented at Canadian Franchise Association Law Day (September 2016). Unique Issues with Master Franchisees, presentation at the Canadian Franchise Association’s 2016 National Convention (April 2016) (co-presenter). Data Management in Franchise Systems, presentation at the Canadian Franchise Association Law Day (January 2016) (co-presenter). Québec Financial Regulator Takes Aggressive Enforcement Steps Against Initial Coin Offering Promoters, Internet and E-Commerce Law in Canada, Vol. 18, No. 5 (2016-2017), 18 I.E.C.L.C. (September 2017) (co-authored with Blair Wiley). Recent Developments in Canadian Franchise Class Actions, Franchise Law Journal, Vol. 35, No. 3 (2016). The Pros and Cons of Sampling Class Members to Assess Aggregate Damages, Class Action (2015) (co-authored with David Morritt). Regional Electricity Market Integration: A Comparative Perspective, Competition and Regulation in Network Industries, Volume 8 (2007) No. 2 (co-authored). To Notify or Not to Notify: Responding to Data Breach Incidents, February 2007 (co-authored with Jennifer Dolman). Beyond Gridlock: The Case for Greater Integration of Regional Electricity Markets, C.D. Howe Institute Commentary, March 2006 (co-authored).